One of the most important things you can do to improve your search ranking on Google is also one of the easiest to set up. Simply register, or update, your Google Places listing. Let us show you how. You’ll see Google Places in action if you search for a business in Google. You can also see these when you look at Google Maps. Ever notice that you see businesses on the map? Ever wonder how they got there? This is how. First, your business may already be listed with Google Places. To find out, go to Google Maps and search for your company (Neighborhood Image, Marion, Ohio) and see if you show up. If you do, it’s time to make sure all the information is correct and add more details. 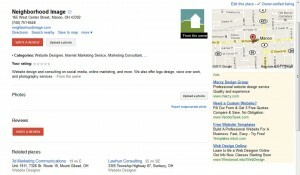 Click on the company name and you’ll be taken to your Google Places page (an example is shown above). Below you can see an example of our page. It has your name, address, phone number, website address, as well as a description and keywords. Or at least it should. You’ll also want to claim ownership of the page. To do this, click the “Business owner?” link in the top right-hand corner of the page. Follow the directions. You will have to verify your information to complete the process. Like I said, couldn’t be easier. Now, you can, and should, go further by uploading some photos or your business or work. You can also encourage people to leave reviews of your business. Of course we say you should do this, but as you can see in the photo, we have not done this. I guess I need to get to work. As always, let us know if you have any questions or need any help! If you have a Facebook for your business, or even for yourself, you may have noticed that the url address to get to your page is long and has a bunch of numbers. What you need is a shorter, easier to remember address. For example, the Facebook address for Neighborhood Image is www.facebook.com/neighborhoodimage. So how do you get you this super special address? It’s easy. Log into Facebook and go to your page. Click on the button that says “Edit Page” (up near the top, right-hand corner) and you should see a bunch of options. Click on “Basic Information” on the left-hand side. You should see an option in the middle of the page that says “Username”. Click on the option and go through the options to get your new, shorter, easy to remember, address to your Facebook page. A couple notes – You must have at least 25 “Likes” to your page before you can claim a custom address. Also, be sure about the name, because once you have chosen a name, it is yours for life. There is no way to change it (at least for now). Let us know if you have any questions and we’ll do our best to help you out. If you’ve ever gone to what you thought was a business page on Facebook only to see a button that says “Add as Friend,” then you’ve just witnessed a violation of Facebook’s terms. It doesn’t really mean anything to you, but this business or organization is in danger of being shut down by Facebook. We’ve noticed lots of local organizations who have unwittingly violated the rules. If you are one of those who accidentally went the route of creating a personal profile rather than a business page, there are only two options. Well, three actually, but the third is a really bad idea. First, you can start up an actual page on Facebook and then tell all of your current friends to “Like” the new page. 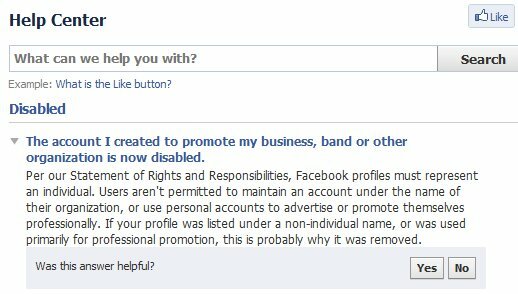 After a certain amount of time, you would shut down the “illegal” personal profile. This works, but takes time and not everyone will hop over. Second, you can simply migrate your current profile to a business page. This is automatic, and permanent, and means that all of your current friends will still be on your new page. Again, this is a permanent change so DO NOT test the migration with your own personal Facebook page. Only do this with the profile you use for your business or organization. Third, you can just keep doing what you’re doing and “hope” that Facebook won’t catch you. This is a bad idea. If you are shut down, you won’t get a warning. It will just happen. Then all of the work you’ve put into building your community will be lost. So, we recommend the second option. As we said, it’s quick, saves (most) of your information and all of your fans. The reason we say most is that your photo albums will not be moved, just those in the Profile Photos section, so you will have to save those manually. You can find details on saving your photos by clicking here. You may also lose previous wall posts. At least one person has also reported losing an event they had created when they were still a profile. The important thing is that you maintain your audience and avoid having to rebuild that valuable resource for your organization. To migrate your Profile to a Page, click here. Once you’ve migrated, make sure to go through all the options available by clicking on the “Edit Page” button. If you have any questions or need pointed in the right direction, just let us know. You can also find lots of information on Facebook by going here.